Mindjammer Press and Modiphius Entertainment are delighted to announce their partnership to produce the new edition of Mindjammer – The Roleplaying Game, a transhuman science-fiction roleplaying game using the Fate Core system, written by ENnie Award-winning RPG and fiction writer Sarah Newton (Mindjammer, Achtung! Cthulhu, Monsters & Magic, Legends of Anglerre, Fate Core – Burn Shift, The Chronicles of Future Earth). Grab your blaster, thoughtcast your orders to the starship sentience, and fire up the planing engines – come and defend the light of humanity’s greatest civilisation as it spreads to the stars! Have you always wanted to play a modern science-fiction roleplaying game – with consistent yet futuristic science, virtual realities, sentient starships, realistic aliens, and mysterious worlds, yet action-packed and filled with adventure? Mindjammer is your answer. It’s a tabletop roleplaying game about heroic adventurers in the galaxy of the far future. With its hyper advanced technology humankind has spread to the stars, discovering ancient lost colonies and mysterious alien worlds. Using the popular and award-winning Fate Core rules, Mindjammer lets you play hardened mercenaries, cunning traders, steely-nerved pilots, intrigue-filled spies and culture agents, aliens, divergent hominids, artificial life forms, and even sentient starships. 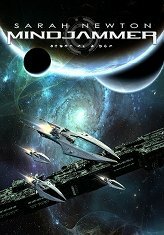 Mindjammer – The Roleplaying Game is a 496-page hardback with gorgeous artwork and astrography by industry stalwarts such as Jason Juta, Eric Lofgren, Andreas Schroth, and Ian Stead. It’s a standalone game with everything you need to play, including innovative new rules for alien life, planets, and star systems, organisations, culture conflict, hypertech, starmaps, background material, virtual realities and techno-psionic powers, and much more. “Mindjammer was first introduced as an incredible supplement for the enormous Starblazer Adventures RPG and it’s fantastic that Sarah has now developed the universe into such an incredible setting and brought it bang up to date with the Fate Core ruleset. I know Fate and sci-fi fans are going to find one of the best and most comprehensive roleplaying games at their fingertips,” said Chris Birch, Publisher of Modiphius. You can pre-order Mindjammer – The Roleplaying Game right now from the Modiphius webstore and download the Thoughtcast Edition 496-page PDF immediately. The hardback version of the game is expected to ship in late March, and hit the shelves in May. A free preview is available from RPGNow. It’s the Second Age of Space – the transhuman adventure is just beginning! MINDJAMMER PRESS is a British games publisher founded by Sarah Newton (Mindjammer, Achtung! Cthulhu, Monsters & Magic, Legends of Anglerre, Fate Core – Burn Shift, The Chronicles of Future Earth) and Chris McWilliam to produce roleplaying games and related fiction, including: the transhuman science-fiction roleplaying game Mindjammer for Fate Core, and its series of supplements and novels; The Chronicles of Future Earth; and Monsters & Magic. Find out more about Mindjammer Press at http://www.mindjammerpress.com or follow them on Twitter @MindjammerPress or Facebook (www.facebook.com/MindjammerPress), or by email at info@mindjammer.com. MODIPHIUS ENTERTAINMENT is a tabletop entertainment publisher whose games include Achtung! Cthulhu, Mutant Chronicles, DUST Adventures, Cogs, Cakes & Swordsticks and much more. Find out more information about Modiphius Entertainment and their games at http://www.modiphius.com or http://www.facebook.com/modiphius, or by emailing pr@modiphius.com. « Mindjammer – The Roleplaying Game out now!